The two pieces of Union correspondence, below, mention Old Federal Road, Cohutta Springs, Spring Place, and other towns. Apparently it relates to the fork of the old Federal Road that went into Murray County, Georgia. The other fork continued west from Ramhurst toward Dalton. I'm not sure if this would be Cohutta Springs "west" or "east." I think it would be "west." I sent out one company yesterday morning eastward to Holly Creek, beyond Spring Place, and another through Ship's Gap to Summerville via Broomtown Valley; the last will not return till to-night. The first company returned last evening, and report a body of 500 rebel cavalry lying on the Westfield turnpike at the foot of the Cohutta Mountain, about twenty miles from here on the road to Ellijay. They are apparently holding that gap for the protection of couriers or other communications between Wheeler and Atlanta. They came there on Sunday from the diretion [sic] of Columbus, having been sent to learn the old Federal road in the neighborhood of Cohutta Springs on Saturday evening, and to proceed in the direction of Ellijay. This body has two companies guarding the ford of Hold's Creek. I do not think they intend to harass the railroad but merely to hold that gap. Colonel, Commanding Fifteenth Pennsylvania Cavalry. Send all your mounted force effective for a march by way of Spring Place and Cohutta Springs toward Savannah, on the Hiwassee River. Colonel Palmer sends a detachment from Dalton by way of Spring Place to Columbus; try to communicate with him. He reports 500 rebel cavalry at the foot of Cohutta Mountain on Westfield road, evidently keeping open communication between Wheeler and Atlanta. Try to break up the line and move on same route to the Hiwassee and co-operate with Colonel Palmer. PREVIOUSLY PUBLISHED ON MY CIVIL WAR BLOG. This area is not at the mineral springs and resort. It is five miles west of the mineral springs, on modern-day Georgia Highway 225, a mile or so south of the Tennessee state line. Link to 1863-1865 post with map (drafted 1863-1864; published 1865) showing the area south of the Conasauga River, but not designating Cohutta Springs P.O. The relevant area on this map is the road running from Spring Place directly north toward Benton Pike, just where it intersects a road that runs southeast toward Ellijay. The place name of Cohutta Springs (where the post office was located from 1836 until at least 1865) does not appear on the map. However, east of that area, on a road running parallel to the S.P. and Cleveland Road, is "Cohutta Springs" (Cohutta Springs, east), where the resort and mineral springs would be located. MAP AND DESCRIPTION. O.R., Series 1, Vol. 32, Pt. 1--Reports [Washington: Government Printing Office, 1891], 423, 469, 472. The War of the Rebellion: A Compilation of the Official Records of the Union and Confederate Armies. Pub. Under the Direction of the ... Secretary of War, United States. Record and Pension Office. U.S. Government Printing Office, 1891. Original from: Pennsylvania State University. Digitized: 6 July 2011. *Typically these main roads run between two towns and are named, in a broad sense, for both towns; hence, "Spring Place and Cleveland Road." Locally, the people in Cleveland or Charleston, Tennessee, would probably refer to it as "Spring Place Road," while people in Spring Place would refer to it as "Cleveland Road" or "Charleston Road." Cohutta Springs as a town is no longer extant. Historically, the community of Cohutta Springs covered a broad area from south and east of modern-day Cisco, Georgia, to north and east of modern-day Crandall, Georgia. On maps from 1836 to about 1900, the area is marked either Cohutta Springs or Cohutta Springs P.O., and it lies on a road that ran between Spring Place, Georgia, to an area east of Cleveland, Tennessee, and on up to Charleston, Tennessee. Today it would be located on Georgia Highway 225, near the intersection of Hall's Chapel Road and Georgia Highway 2. There are several other small communities dotted throughout the area, each with its own unofficial place name (no longer receiving mail via the place name, but sometimes still called by its old, traditional place name). Some old maps have two separate spots designated as "Cohutta Springs." Other maps have one or the other, but not both. Our blog features both areas, and will usually try to differentiate by saying "east" or "west." This post features Cohutta Springs (west), near the location of Oakwood Plantation, once known as Waterhouse's Mill and house. The area is designated in various ways in census. In 1870 Census, the area is designated as 874th Militia District, with the Post Office designated as "Cohutta Springs" in 1860 and "Spring Place" in 1870 (showing how mail delivery changed depending on which post office was available). In 1880, the area is part of the Tenth District, no. 874. On property deeds, the area is designated as Tenth District, 3rd Section, Murray County, Georgia (or sometimes, Tenth District, 3rd Section, originally Cherokee, now Murray County). It would be interesting to know whether the residents of this area actually referred to it as "Cohutta Springs." Callaway Campbell did, and used the post office as his mailing address. But clearly, the resort area, five miles away, was also called Cohutta Springs. Other place names for the area, depending on the exact vicinity of the land and which mailing route is in use, are Cisco, Georgia, and Crandall, Georgia (though the actual town of Crandall is some miles away, and is closer to the other Cohutta Springs). This blog includes two communities, both of which were known as Cohutta Springs. This post describes Cohutta Springs (east). Cohutta Springs (east) is the location of an old historic mineral springs. It was a resort area featuring a hotel, boarding houses, cabins, and accessible mineral springs, thought to be of medicinal value. There were doctors and pharmacists there at various times. In the 1860s, Myra Inman, of Cleveland, Tennessee, summered there. Alexander Stephens, vice president of the Confederacy, once stayed there. It is near the old Summerour Chapel. Later, there was Old Summerour Methodist Church; and now, Amazing Grace Baptist Church. The history of the area is evident in the names of the cemeteries and streets. Amazing Grace Baptist Church is now the only church on Summerour Church Road. The Summerour Methodist Cemetery is across from there, and Old Summerour Cemetery is just east/northeast of there, across the railroad tracks. Summerour Church Road runs into Cohutta Springs Road. Both roads intersect U.S. Highway 411 on the west. Cohutta Springs Road leads to the old mineral springs area, which is now on private property. Cohutta Springs Conference Center, owned by the Georgia Cumberland Conference of Seventh-Day Adventists, owns part of the land near there. The mill ruins may be on their property. The property on the south side of the road, where the old hotel ruins are, is owned by other neighbors. Murray County had not seen a major battle on its soil during the Civil War. Perhaps part of the reason is that the railroad had not yet been built down to Murray. Times were difficult after the War. 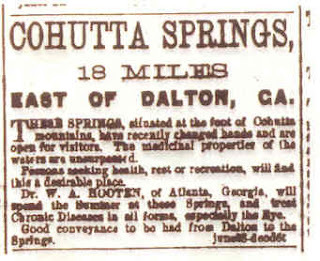 Even so, Cohutta Springs must have still been popular as a resort and watering place, if this Atlanta physician found it desirable to summer there and treat patients. "Dr. W.A. Hooten of Atlanta, Georgia, will spend the summer at these Springs, and treat Chronic Diseases in all forms, especially the Eye." Possibly, Dr. Hooten planned to treat, or perhaps capitalize on, sore eyes, a disease that was prevalent during the Civil War. Jacob Headrick, of the "other" Cohutta Springs (west) had suffered from sore eyes, a contagious disease that broke out in camp and spread among the soldiers. These mineral springs were in the area of Cohutta Springs (east), northeast of the old Summerour Chapel. By the 1860s, several boarding houses and resorts had located around the old mineral springs at Cohutta Springs in the 2nd Section of Murray County (Cohutta Springs, east). Water was an important commodity, then as now. People would dip drinking water from the wellspring. Also at the eastern Cohutta Springs were some boarding houses and resorts. People came to summer at the mountain spring, as respite from the summer heat. One young lady, Myra Inman, of Cleveland, Tennessee, writes about Cohutta Springs in her diary. Her family summered at Cohutta Springs, not long before the Yankees came into Cleveland. Cohutta Springs is also mentioned in Sara Wadley's diary. Alexander Stephens, the vice president of the Confederacy stayed at Cohutta Springs one summer, early in the War (before the Atlanta Campaign brought the Yankees into Georgia). Wadley (as I read between the lines of her diary) may have had a crush on a young man who was Stephens' secretary. These diary entries refer to Cohutta Springs, east. Myra Inman places the location as about two miles from Summerhour's. The mineral springs is on what is now Cohutta Springs Road, Crandall, Georgia (off of U.S. Highway 411). Cohutta Springs, west: Thomas Calloway, of Cleveland, Tennessee, and his nephew, Callaway Campbell, owned land near Waterhouse's at the "other" Cohutta Springs (five miles west of the mineral springs). That Cohutta Springs was on the Spring Place and Cleveland Road (now Georgia Highway 225, where Hall's Chapel Road and Georgia Highway 2 intersects 225). The area was scouted by Union soldiers in 1864. Colonel Eli Long, U.S.A., camped at Waterhouse's plantation in February 1864, en route to the First Battle of Dalton. Clearer references to the Myra Inman diary (book), Sara Wadley diary (on-line excerpts), and the Callaway Campbell letters (library holdings) will be given later. Homesteaders poured into Murray County after the 1838 removal of the Cherokee. Land speculators had bought the land cheap. They quickly resold it at a profit ~ some in whole lots, others subdivided into halves and quarters. Many of the county's early residents were from nearby counties in Tennessee. (My own genealogical research shows that northern Murray County was pretty much settled by East Tennesseans from Blount, Sevier, and surrounding counties in Tennessee). The early days of settlement were pretty rough ~ there were some lawless elements in the county. *NOTE: My curiosity has been piqued in a big way by the old mill. It's a little tricky to research. I haven't walked up there myself. The location is in the woods, well north of the old Coffey Mill of the early 1900s, near North Cohutta and Hampton Springs. Crandall residents are familiar with the mill site. Differences in the old surveys of different eras make it a little tricky to line up the exact corners of lot 320 and the same lot on the modern map, as it it marked. The mill was on or near the old one-acre plat reserved by Morris and/or Edmondson in those very early deeds. The Cohutta Springs History blog is meant to explore an old community in Murray County, Georgia, known as Cohutta Springs. The place name appears in at least four locations on old maps, and on some maps, actually appears prominently in two places at once. For that reason, we will sometimes distinguish between "Cohutta Springs, east" and "Cohutta Springs, west," though both of them appear on old maps simply as "Cohutta Springs." The original place name appears to belong with the mineral springs, located at the base of Grassy Mountain, northeast of the old Summerhour Chapel. The springs are at the dead end of Cohutta Springs Road, off of U.S. Highway 411. The post office opened a branch five miles west of the springs in 1836, at which time the second place name for Cohutta Springs appeared on old maps. Later maps designate the second "Cohutta Springs" as "Cohutta Springs P.O." The post office suspended mail delivery during the Civil War. Some years later, after that post office closed, another branch was opened west, but much nearer, the mineral springs, and the place name on maps followed it. The other two instances of "Cohutta Springs" as a place name are an additional site very near the springs, and an area north of the springs called "North Cohutta Springs."